Facebook has radically altered (some would say ruined) the dating scene. Relationships and breakups are now public information, first dates have lost their mystery because of preemptive Facebook stalking, and once-stable relationships are threatened by flirtatious wall posts. 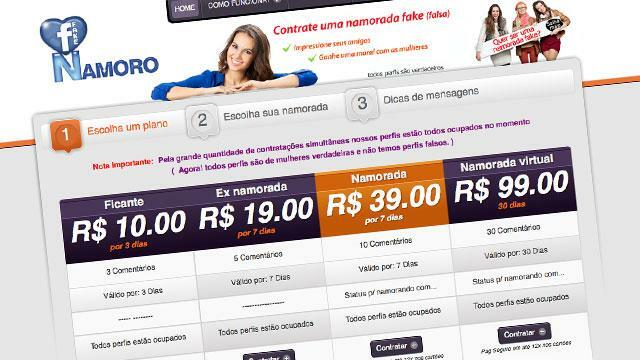 Now, in this altered dating landscape, a Brazilian website has apparently identified a niche for potential profit. What is their product? Fake Facebook girlfriends. For $39.00 NamoroFake.com.br will create a Facebook girlfriend profile for you that includes comments and the all-important "relationship status" change for thirty days. Or, for those on a budget, $19.00 will buy you a fake ex-girlfriend. "Impress your friends," says the website. "Gain confidence with women." Indeed those trading in virtual deception may find an ally in NamoroFake. So is hiring a fake Facebook girlfriend right for you? The website suggests a number of possible reasons to hire a fake flame. Pure desperation didn't make the list. "Sometimes having a fake girlfriend on the Internet helps make you more popular with the women and increases your self esteem," says the website. "Sometimes people need to rent a fake girlfriend to make jealous a jealous ex-girlfriend. In truth, we have a lot of clients for that reason," it says. "After a breakup, the ex-boyfriends want to show that they are already with another person to feel good. One immediate way to do this is to hire a fake girlfriend to maintain appearances." The justifications need not be entirely restricted to jealousy or "keeping up appearances," suggests the site. Maybe your family is pressuring you to settle down with someone and you need a quick fix to get them off your back. If so, NamoroFake might just be the solution. To bolster the ranks of fake girlfriends, the website is inviting women to send in their profiles, with a 50 percent profit-sharing incentive. There are currently no fake Facebook boyfriends for hire, though the site says it has plans to offer them in the future.